These are lyrics by Parliaments that we think are kind of repetitive. 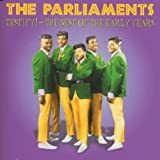 Parliaments', "Give Up The Funk (Tear The Roof Off The Sucker)"
Ow, I want you to shut up! I seriously thought I was going to die listening to this song.